Located within the Somerset Levels, The Old Bakery, Fivehead is perfectly situated for exploring the beautiful countryside on the holiday route to the Dorset Coast or Devon Border. We are equidistant from Taunton, Yeovil, Bridgwater and Glastonbury and just a 15 minute drive from the M5 and A303. We are a dog friendly B&B. Mick and Philippa would like to welcome you to their warm, luxurious and well equipped B&B in the pretty Village of Fivehead. 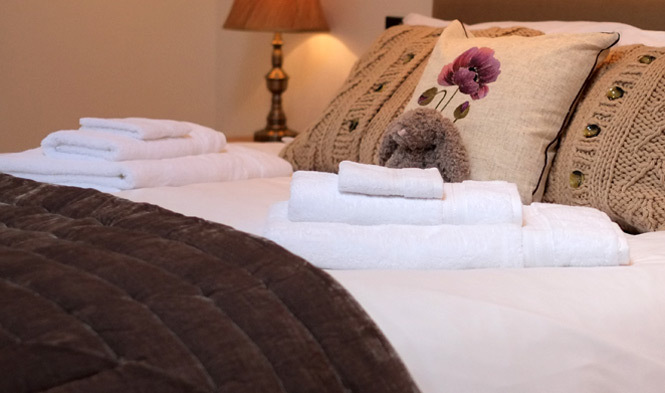 Relax in our dog friendly, luxury en-suite room with its own entrance and off-road parking. The Baker’s Suite is a light, spacious well-appointed room with every convenience including en-suite shower, bath and a super king size bed which can be split into twin beds if required. Enjoy a choice of breakfast dishes that can be served in your own room or our large farmhouse style kitchen. We serve local bread and produce when available. Relax after your journey, enjoy some complimentary cakes in your room with a pot of tea or cafetiere of coffee and plan your stay using our books and maps. We are ideally located down a quiet country lane with easy access to walks, fishing, birdwatching, horse riding and cycling being located on the National Cycle Route. Prices: £105 per night; £95 single occupancy. There is no extra charge for dogs and we welcome children over the age of 15. Check for availability here.